The 503 Service Unavailable error is an HTTP status code that means the website's server is simply not available right now. Most of the time, it occurs because the server is too busy or because there's maintenance being performed on it. Are You the Webmaster? See the Fixing 503 Errors on Your Own Site section further down the page for some things to look at if you're not sure what to do. A 503 error message can be customized by the website it appears on, or the server software that generates it, so the ways in which you might see it vary greatly. 503 Service Unavailable errors can appear in any browser in any operating system, including Windows 10 back through Windows XP, macOS, Linux, etc...even your smartphone or other nontraditional computers. If it has internet access, then you could see a 503 in certain situations. The 503 Service Unavailable error displays inside the browser window, just as web pages do. Sites that use Microsoft IIS may provide more specific information about the cause of a 503 Service Unavailable error by suffixing a number after the 503, as in HTTP Error 503.2 - Service Unavailable, which means Concurrent request limit exceeded. See More Ways You Might See a 503 Error near the bottom of the page for the whole list. The 503 Service Unavailable error is a server-side error, meaning the problem is usually with the website's server. It's possible that your computer is having some kind of problem that's causing the 503 error but it's not likely. Retry the URL from the address bar again by clicking the reload/refresh button, or pressing F5 or Ctrl+R. Even though the 503 Service Unavailable error means that there's an error on another computer, the issue is probably only temporary. Sometimes just trying the page again will work. If the 503 Service Unavailable error message appears while paying for an online purchase, be aware that multiple attempts to check out may end up creating multiple orders — and multiple charges! Most payment systems, and some credit card companies, have protections from this kind of thing but it's still something to be aware of. Restart your router and modem, and then your computer or device, especially if you're seeing the "Service Unavailable - DNS Failure" error. While the 503 error is still most likely the fault of the website you're visiting, it's possible that there's an issue with the DNS server configurations on your router or computer, which a simple restart of both might correct. If rebooting your equipment didn't correct the 503 DNS Failure error, there might be temporary issues with the DNS servers themselves. In this case, pick new DNS servers from our Free & Public DNS Servers list and change them on your computer or router. See How to Change DNS Servers if you need help. Another option is to contact the website directly for help. There's a good chance that the site's administrators already know about the 503 error, but letting them know, or checking the status on the problem, isn't a bad idea. See our Website Contact Information list for contact information for popular websites. Most sites have support-based social network accounts and some even have phone numbers and email addresses. If the website giving the 503 error is a popular one and you think it might be down completely, plug the URL into isup.me or IsItDownRightNow?. A smart Twitter search can usually give you the answer, too. Try searching for #websitedown on Twitter, replacing website with the site name, as in #facebookdown or #youtubedown. An outage on a big site will usually generate lots of talk on Twitter. Come back later. 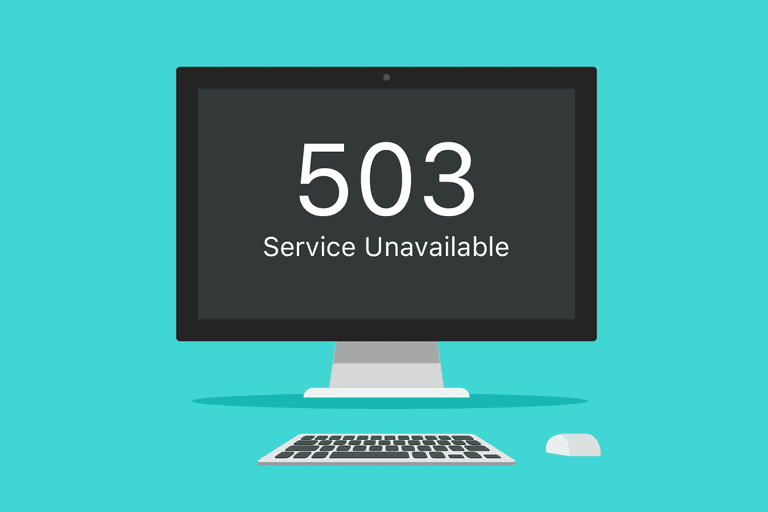 Since the 503 Service Unavailable error is a common error message on very popular websites when a huge increase in traffic by visitors (that's you!) is overwhelming the servers, simply waiting it out is often your best bet. Frankly, this is the most likely "fix" for a 503 error. As more and more visitors leave the website, the chances of a successful page load for you increases. With so many different web server options out there, and even more general reasons why your service might be unavailable, there isn't a straightforward "thing to go do" if your site is giving your users a 503. That said, there are certainly some places to start looking for a problem...and then hopefully a solution. Start by taking the message literally — has something crashed? Restart running processes and see if that helps. Beyond that, look at not-so-obvious places where something might have hiccuped. Where applicable, look at things like connection limits, bandwidth throttling, overall system resources, fail-safes that might have triggered, etc. In what's very likely a "double-edged double edged sword" for your website, it may be that it's suddenly very, very popular. Getting more traffic than your site was built to handle, almost always triggers a 503. However, the 503 error could also be a result of a malicious denial of service (DoS) attack. If so, getting into contact with the company hosting your website would be wise, to discuss steps that can be taken to reduce the liklihood of it happening again, or to better prepare for another in the future. Even an unintential DoS attack can take place, where a virus on the server is sucking away usable system resources and slowing the server down to the point that it causes a 503 error. In Windows applications that natively access the internet, a 503 error might return with the HTTP_STATUS_SERVICE_UNAVAIL error, and maybe also with a The service is temporarily overloaded message. Windows Update might also report an HTTP 503 error, but it will display as error code 0x80244022 or with a WU_E_PT_HTTP_STATUS_SERVICE_UNAVAIL message. Some less common messages include 503 Over Quota and Connection Failed (503), but the troubleshooting above applies all the same. More information on these IIS-specific codes can be found on Microsoft's The HTTP status code in IIS 7.0, IIS 7.5, and IIS 8.0 page. The 503 Service Unavailable error is a server-side error, and so is very much related to other server-side errors like the 500 Internal Server Error, the 502 Bad Gateway error, and the 504 Gateway Timeout error, among others. Several client-side HTTP status codes exist, too, like the common 404 Not Found error, among others.